Born 1970 in Tokyo, Kazutaka Satoh graduated from Tsukuba University. Satoh started volunteering at Comic Market in 1990. He worked in the department as a liaison for doujinshi authors, educating and supporting several thousand manga creators in the process. In 2006, Satoh established Circle.ms, a business that provides online solutions for doujin culture related events, such as doujinshi marketplaces and cosplay events. Circle.ms provides registration services and online catalogs for Comic Market and other doujinshi events in Japan. 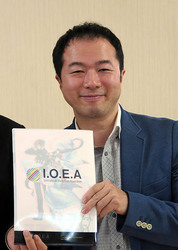 In 2012, Satoh started planning the establishment of the International Otaku Expo Association, and since its establishment in March of 2015, he assumed the role of its representative. Satoh hopes that a new world can be realized through otakus around the world interconnecting with each other.